Announcing Your Celebration 2018 ANZ Speakers and MORE International Speakers! As if our Celebration 2018 lineup wasn’t already amazing, we’ve added more iconic speakers to the list, including a handful of epic ANZ leaders. 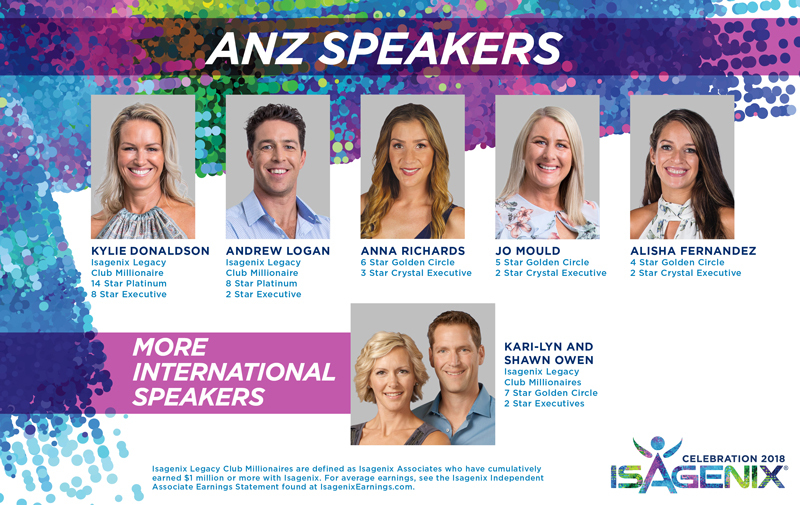 Check them out below and don’t forget to grab your ticket at ANZ.IsagenixEvents.com before Friday 9 March to experience everything that Celebration 2018 has to offer! A country girl at heart, Kylie Donaldson never imagined her life as a network marketer. Introduced in 2012, she began her journey purely as a product user with no intention of building an Isagenix business. Casting her vision after falling in love with the products, she soon saw the potential and became passionate about helping others to achieve their health and financial goals. She is the first in Australia to max out two business centres and is the number one income earner in Australia and New Zealand. A lover of the outdoors, you can often find Kylie camping, jet skiing, riding motorbikes and going on adventures with her two children, Charli and Ryder and her partner, Jarrad. The owner of his own physiotherapist practice, Andrew was overworked and strapped for time. Eager to gain back his energy for the sake of his family and his health, he began using the Isagenix products. Although scepitcal, the products worked and it wasn’t long before people noticed. In four years, Andrew and his wife, Angie, went from exhausted and overworked with a baby on the way to healthy and happy with the help of Isagenix. Eager to help others achieve the same, this inspiring couple dedicates their time to helping their friends and families create the life they had always dreamed of. Andrew is eager and excited to share his leadership tips to help event attendees boost earning potential through Isagenix. Canadian former Corporate Executive, Shawn, currently runs his own Leadership Company in conjunction with his thriving Isagenix business which he runs with his wife, Kari-Lyn. As well as being parents of two gorgeous children, this power couple have achieved a considerable amount of success, not only in their business but also as highly regarded Trainers and Public Speakers! While this couple are known for being masters of tackling the initial and most difficult stage of growing an Isagenix business, they’re also renowned for helping others achieve their goals. Having worked in federal politics and as a Business Development Manager, Anna Richards never imagined leaving the corporate world. An advocate for healthy living, Anna was eager to take her health goals to a new level and was introduced to Isagenix to get her started on her journey. Passionate about the products that were quickly changing her health and life, Anna began building her Isagenix business and hit Crystal Executive within 3 months, making the decision to leave behind her corporate career after matching her full-time income with her Isagenix income. After 16 months of hard work, Anna was able to help retire her husband, Morgan, from his full-time corporate career and he joined Anna in building their business. Anna’s leadership encourages others to focus on being the change they wish to see and how to attract like-minded people who are passionate about changing lives. With 17 years in high-flying, corporate roles, Jo never envisioned leaving it all behind to pursue building her own business. As the General Manager of a healthcare company, health and wellness was always a priority to Jo and she was excited to take her health to new levels as an Isagenix product user. Over the past two years, her belief in Isagenix grew as she witnessed the products changing not only her life but also the lives of thousands of others. Passionate about leadership, she embarked on building her Isagenix business, with her consistent support of her team and community inspiring others to live a life of service and gratitude. Born and raised in Dubai, Alisha moved to Sydney to study a Bachelor of Commerce at the University of Sydney. Love drew her to the Gold Coast, where she married her husband, Lloyd, and began a career in the corporate world as a Paralegal. Although comfortable, Alisha and her husband were eager to start a business together, something close to their heart that focused on improving the life of others. It seemed an unattainable goal and having settled into their routine, they pushed the dream to the back of their minds – until they were introduced to Isagenix. Passionate about the products and helping others, Alisha and Lloyd build their Isagenix business together and have since earned their spot into START 1000. They are honoured to not only be leaders but also to help create leaders of the future.